The Indian National Football team has always craved for quality strikers with most of the talk of the current generation about the Indian strikers restricted to IM Vijayan, Baichung Bhutia and Sunil Chettri. 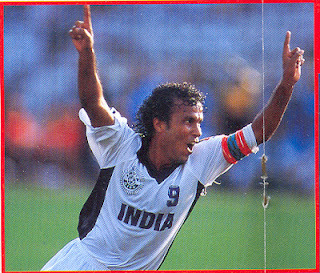 One name that is often forgotten is that of Bruno Coutinho, one of the finest strikers who came from Goa and scaled dizzy heights in 1990s . Bruno was a inspirational figure during his peak years and the then TechnicalAi? ?Director of Indian Football,Ai??RustamAi? ?Akhramov termed him of World Cup Standards. His contribution for the team during perhaps the mostAi? ?turbulent time in Indian Football must never be forgotten. Born on 6th October 1969,Ai? ?Bruno Coutinho started playing football from his school days. He studied atAi? ?Monte De Guirim and was spotted first byAi? ?Paul Raj and was initially coached by Salvador Fernandes. In his first game for his school he scored 3 goals and then went on to win the prestigious Ai? ?U-17 Subroto Cup for his school. Coutinho first represented India in a school-level tournament in Brunei in 1987 and then joined Dempo SC in 1987 , staying there for a season. Bruno Coutinho made his debut for the national team in 1989 at theAi? ?President Cup in Dhaka and establishedAi??himselfAi? 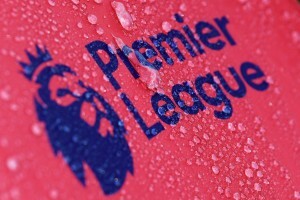 ?as the leadingAi??striker. In a career spanning around 12 years, theAi??diminutiveAi??strikerAi??terrorizedAi? ?the rival defenders with his skill and pace. Bruno captained the U-23 side in Pre-Olympics qualifiers in 1991 and then went on to become the captain of the senior team for the 1995 SAFF Games and 1999 SAFF Cup. In the 1999 edition of SAFF Cup in Goa, Coutinho scored the winner against Maldives in the semi-finals to see India through 2-1 and then scored the first goal in final against Bangladesh to see India win 2-0. Bruno Coutinho started his club career with Dempo Engineering in 1987-88 season and then joined Salgaocar theAi??followingAi??seasonAi? ?and stayed with the club till 2002, becoming a legend at the club. Salgaocar experienced one of their finest and most successful eras withAi? ?Coutinho in the team. He helped his club win the Ai? ?Federation Cub in 1997, Rovers Cup in 1989, 1996, Taca Goa title in 1989 and the National Football League in 1998. Salgaocar reached the pinnacle of Indian Football withAi? ?Coutinho at the helm of affairs by winning the Federation Cup in 1997 and NFL in 1998. Coutinho was a consistent goal-scorer on the domestic scene scoring 9 goals in the 3rd NFL that Salgaocar won. He found the net 7 times in the 5th edition of NFL – an impressive tally since his club scored only 23 goals. Coutinho then joined Vasco in 2002 but soon took up the coaching role forAi? ?Fransa FC, a second division club as he was troubled by a nagging knee injury. In recognition of hisAi??exploitsAi? ?he wasAi? ?adjudged theAi? 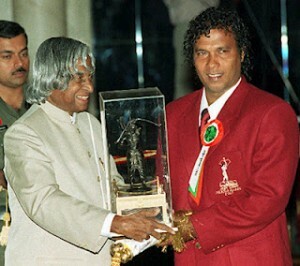 ?Best Sportsman of the year by a Sports Journalist Association in 1996.Ai? ?Coutinho alsoAi??mesmerizedAi? 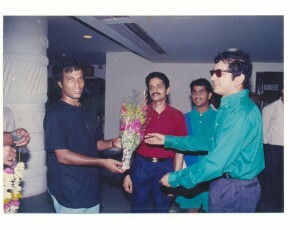 ?the fans whenever he turned up for Goa in the Santosh Trophy. He represented his state more than 10 times in Sanotsh Trophy. The 1999 Santosh Trophy deserves a special mention whereAi? ?Coutinho was named the player of the tournament. The following year Goa government awarded him with Kerkar Award for his service to the game. Played in Salt Lake Stadium, the 1997 Federation Cup final pipped East-BengalAi??againstAi? ?Salgaocar and East-Bengal came into the match on a high after defeating Mohun Bagan 4-1 after a history making hattrick by Baichung Bhutia in semi-final. Salgaocar side had the likes ofAi? ?Bruno Coutinho, current Pune FC coachAi? ?Derrick Pereira and the IndianAi??AssistantAi??coachAi? ?Savio Medeira. Ai? ?Coutinho gave Salgaocar the lead in the 23rd minute butAi? ?Nigerian Samuel Omollo equalized in the 83rd minute. Like many of hisAi? ?colleagues IM Vijayan and Jo Paul Ancheri, Ai? ?Bruno Coutinho played during the most direction-less period of Indian Football and yet his contribution to the game is of the highest levels, a testament to his amazing skills.